Chinese orbital launch vehicle. 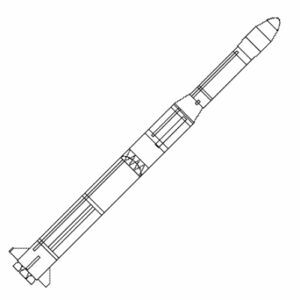 The CZ-2E added four liquid rocket booster strap-ons to the basic CZ-2 core to achieve a low earth orbit payload capability approaching the Russian Proton, US Titan, or European Ariane rockets. The Long March 2E had a maximum payload capability of 9,500 kg to low earth orbit. AKA: Chang Zheng-2E;CZ-2E;Long March 2E. Status: Retired 1995. First Launch: 1990-07-16. Last Launch: 1995-12-28. Number: 7 . Payload: 9,200 kg (20,200 lb). Thrust: 5,920.00 kN (1,330,860 lbf). Gross mass: 460,000 kg (1,010,000 lb). Height: 49.70 m (163.00 ft). Diameter: 3.35 m (10.99 ft). Apogee: 200 km (120 mi). 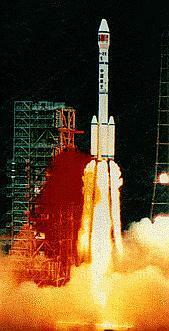 The CZ-2E was based on the mature technology of previous versions of the Long March launch vehicles. Wang Uongzhi was the Chief Designer for the vehicle. With a solid Perigee Kick Motor (EPKM, built by Hexi Company, China), the CZ-2E could put 3,500 kg into a geosynchronous transfer orbit. In May 2001 it was announced that another upper stage, the ETS was being developed for the CZ-2E. This would be an adaptation of the CTS of the CZ-2C, consisting of a Spacecraft Adapter and an Orbital Maneuver System. LEO Payload: 9,200 kg (20,200 lb) to a 200 km orbit at 28.00 degrees. Payload: 3,370 kg (7,420 lb) to a GTO with solid kick stage.. Launch Price $: 50.000 million in 1999 dollars. Stage 1. 1 x CZ-2E-1. Gross Mass: 196,500 kg (433,200 lb). Empty Mass: 9,500 kg (20,900 lb). Thrust (vac): 3,265.143 kN (734,033 lbf). Isp: 289 sec. Burn time: 166 sec. Isp(sl): 261 sec. Diameter: 3.35 m (10.99 ft). Span: 6.00 m (19.60 ft). Length: 23.70 m (77.70 ft). Propellants: N2O4/UDMH. No Engines: 4. Engine: YF-20B. Other designations: L-180. Status: In Production. Stage 2. 1 x CZ-2E-2. Gross Mass: 91,500 kg (201,700 lb). Empty Mass: 5,500 kg (12,100 lb). Thrust (vac): 831.005 kN (186,817 lbf). Isp: 298 sec. Burn time: 295 sec. Isp(sl): 260 sec. Diameter: 3.35 m (10.99 ft). Span: 3.35 m (10.99 ft). Length: 15.52 m (50.91 ft). Propellants: N2O4/UDMH. No Engines: 1. Engine: YF-25/23. Other designations: L-90. Status: In Production. Stage 3. 1 x EPKM. Gross Mass: 5,985 kg (13,194 lb). Empty Mass: 541 kg (1,192 lb). Thrust (vac): 117.000 kN (26,302 lbf). Isp: 298 sec. Burn time: 135 sec. Diameter: 1.70 m (5.50 ft). Span: 2.50 m (8.20 ft). Length: 3.10 m (10.10 ft). Propellants: Solid. No Engines: 1. Engine: EPKM. Status: In Production. Comments: Perigee kick motor for putting CZ-2E payloads into geosynchronous transfer orbit. Thrust, burn time estimated. Specific impulse calculated based on motor payload/delta v performance and masses. More at: Chang Zheng 2E. Family: orbital launch vehicle. Country: China. Engines: YF-25/23, YF-20B. Spacecraft: Apstar, HS 601, Badr, AS 7000. Projects: Asiasat. Launch Sites: Xichang, Xichang LC2. Stages: Perigee Orbit Transfer Motor, CZ-2E-1, CZ-2E-2, EPKM, LB-40. Agency: Aussat, CALT, Echostar. Launch photo of Long March LM-2E launch vehicle.